By the numbers… 5 days – 15 races – 6500 athletes including 150 elites – 70+ countries represented . 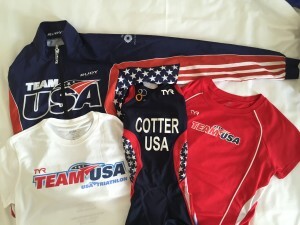 Each country has their own qualification process – for Team USA, the qualification race was the USAT Age Group National Championships in Milwaukee, WI, in August, 2014. So over a year to plan, prepare and not get injured or interrupted by life! 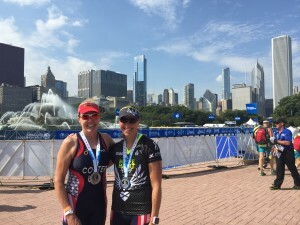 Of the 25 who qualified in F 55-59, 19 raced in Chicago. 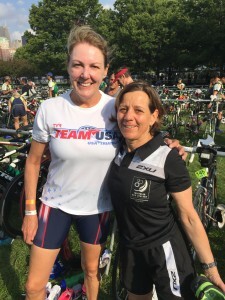 I was joined by my Forward Motion Race Club teammate, Elaine Morison, who is a veteran of many world championships in the triathlon and aquathlon. 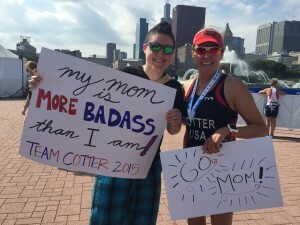 Our age group is a friendly bunch and it was great to meet other athletes. 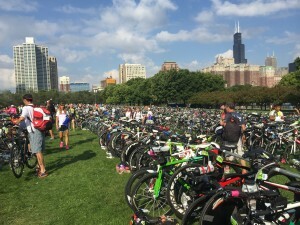 The day before the race, there was a lot to do – packet pickup, bike pickup (RaceDay Bike Transport drove it out in a truck from California), Team USA picture, race recon and bike check-in. With roads closed around the race site, I ended up walking about 5 ½ miles. The good news was that a midday race start for my wave meant I got to sleep in a bit! 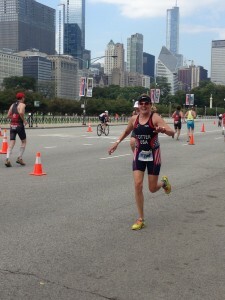 The race venue was spectacular – on the shore of Lake Michigan in downtown Chicago. 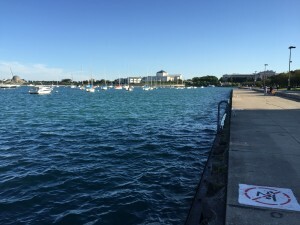 The swim was in Lake Michigan, between the seawall and boat moorings. We waited in the corral ready to be herded down the chute and into the water. The water was about 67 degrees, and with the swim straight along the seawall, navigation was easy. It was also great for the spectators as they could just walk along the seawall and see the swim from start to exit. Winds about 15 mph out of the SE produced a nasty chop with waves reflecting off the seawall with no regularity. 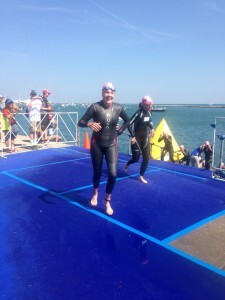 About 100 yds into the swim, I inhaled a big gulp of water and found myself treading water and coughing/choking. I told myself to be calm and start swimming again. After that I was ok, but not a fast swim for me. 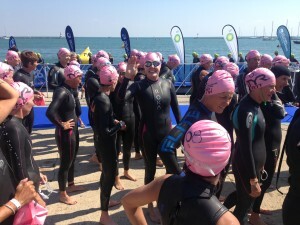 Exiting the swim, I was greeting by my fans (aka my kids) and I couldn’t help but smile. A long transition with a total of .4 miles but all carpeted. We were not allowed to take off our wetsuits until we were at our bikes so it was nicely adhered to my legs when I went to strip it off. The transition area was mostly grass but with large sand areas and it was impossible to get out without going through the sand. I decided to go sockless on the bike and just deal with the sand in my bike shoes. And, we were required to wear our race bib numbers on the back of our bodies on the bike – I felt sorry for the athletes that were being turned back at the transition exit to get their race belts. The mount line was congested (a preview of congestion on the bike course) but I was able to get do my gliding mount into my shoes already attached to my pedals. I would call this a technical bike. While it was mostly flat, with 3 laps on a course that had narrow sections, some very rough pavement, wind and tight turns, there was a huge amount of overlap of athletes with a lot of disparity of speeds. After seeing one cyclist down and then witnessing another woman crash right in front of me, I decided to back off the speed, be hyper vigilant and not take risks. For a non-draft course, there was so much congestion that blocking and drafting was rampant. I decided to just keep my distance from other athletes as much as I could and just sacrifice a bit of speed. After the bike dismount line, another long run around the outside of transition to the far entrance. I was glad I did my (now normal) “flying” dismount, leaving my shoes on the bike so I could run barefoot rather than on my slippery bike shoe cleats. With the sand in transition, I decided to put on socks for the run to save my skin, and then grabbed a gel and my visor and off I went. By the time I started the run, the Heat Index “red warning” flag was raised for the combined air temperature and humidity (found this out from my family after the race!) I took water at each stop and downed a gel – not something I typically do on a sprint race. With 1 ½ laps on the run, it was made for spectators. There was a great sense of national pride. The Americans on the sidelines were cheering for me by name (on my suit) and it was great to watch the same from the British, Australian, Mexican and other spectators all cheering for their nationals. I was delighted to see my fans (family) and gave them a wave and a smile. I was in the moment! One of the cooler parts of being on Team USA for this Age Group World Championship – team officials positioned before the final stretch hand each American athlete a flag to carry across the finish line! I finished in 1:28:31 – good enough for 30th of 61 finishers in my age group. And my speedy teammate, Elaine Morison, was 22nd. Top half and proud showing for Forward Motion Race Club. The winner of the sprint distance race for my age group, Ellen Hart of the USA, also won the age group in the Ironman World Championships in Kona, 3 ½ weeks later!! 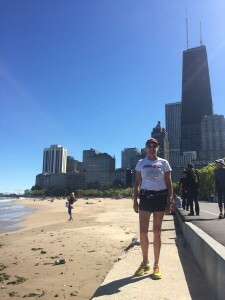 And the final treat – two days later I took a self-guided running tour of Chicago!